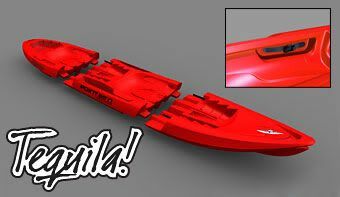 Direct from our friends at Point 65 in Sweden, this “take-apart” kayak, called The Tequila, can be reassembled in–ready for it?–10 seconds flat. They’ve developed a sort of snap together system that is not only structurally sound but also safe and stable. This is not an inflatable. It’s a rigid high-performance kayak that amazingly you can put in the trunk of your car and even store under your bed.